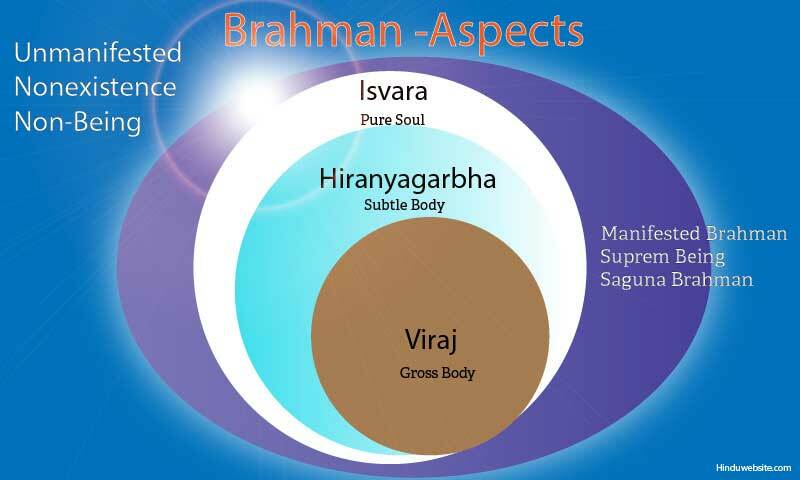 Summary: In this essay we present the highest manifestations of Brahman namely the indescribable Nirguna Brahman without attributes, Isvara who is the Lord of the universe, Hiranya Garbha or the Cosmic Egg and Viraj, the manifested world. Strictly speaking everything in the universe is a manifestation of Brahman only. Innumerable are his forms and manifestation, but He is One and Alone, without a beginning and without an end. He pervades everything, is hidden in everything and enveloped by all that is here and elsewhere. In the Upanishads we come across many verses on Brahman extolling his universal dimensions and infinity. However at the primal level of classification, we can say that the scriptures speak of mainly two aspects of Brahman. On the one hand we have the unmanifested Brahman and on the other we have the manifest Brahman. The former is the pure state of Brahman without qualities and the latter is the manifest state of Brahman with qualities. In the manifest state we believe there are several planes of consciousness, dimensions, time frames, worlds or planes of existence and realities. There is the material universe that is known to the senses and the transcendental universe known only to the gods and beings of the highest planes. Brahman is remote and mysterious, known only to few. No one truly knows why and how of his manifestations, but attribute his actions and movements to some kind of absorbed and blissful ideation. In each world he manifests himself according to the need and the plan he works out. The Upanishads try to explore this rather difficult subject of trying to express the inexpressible play of Brahman by simplifying his manifestations into the following four aspects or dimensions. The pure Non-Being, or the unmanifested (avyakta) Brahman, without any distinguishing qualities or attributes (nirguna) is the First principle. Variously described as the Ancient and the one without a beginning and without an end and the one without a second, very little indeed is known about this Eternal, Imperishable, and the unchangeable principle. The Upanishads are full of descriptions about It, but the confusion they create in our minds is much more than the clarifications they provide. The Upanishadic seers were content with such description as " This", "That" or "It" when they spoke of this Eternal Principle, trying to make It comprehensible to the evolving minds of their disciples. We are told that It is beyond all. There the mind does not go, nor the senses, nor our understanding. It is always in front of the senses and intelligence. It is only through personal experience perhaps one may grasp a little about It. But even about this we are not sure. It is doubtful whether any one can really experience something which does not exist or which is simply non-existence or non-Being and come back to us and describe it to us in the normal planes of thought. "Non-existent does one become if a person knows Brahman as Non-Being." (Taittiriya Upanishad II.6.1). Perhaps it was why the Buddha was silent about the existence of God and why many schools of philosophical thought arose in ancient India questioning the very existence of God as a central controlling universal principle. The problem is that the human mind which is accustomed to the language of the words and symbols cannot grasp the Absolute Truth that cannot really be compared to anything else. Even the devas and the gods of still higher planes have little understanding of It, as is evident from the descriptive accounts of gods encounter with It in the Kena Upanishad. We do not even know why in the first place He created all this. The explanation that He created these worlds and beings for His delight or Ananda is too simplistic an explanation to satisfy the inquisitive curiosity of a well developed mind. If the Absolute creates something out of something else, be it a cause, a purpose or some reason, then that cause, purpose or reason, would be above Him and He cannot be called the Absolute. If the Absolute is eternal and timeless and is not subject to any causative principle or the dimensions of time and space, how could there be any gap between Him and His creation? He and His creation must have happened simultaneously, without a second, without any distinction or differentiation. Surely the creative process must have begun without any reason, without any motive, almost as if it was a spontaneous process, without the intervention of Time and space or a process at the Absolute level. That the process of creation is spontaneous and without a cause would perhaps rattle many religious minds, but we have no better explanation to offer than this if we want to accept the First Principle of the universe as the Absolute, Eternal, Infinite and Truth Principle. (Brahman as infinite). Perhaps there was a beginning to the process of creation but it might never come to a permanent conclusion, as the Creative Principle that manifested out of Him is also eternal and beyond dissolution as we understand in the subsequent paragraphs. As the creator, sustainer and destroyer of the worlds, He is also the Trinity, Brahma, Vishnu and Mahesa. They are but one though they appear differently to the mortal world. They are the three qualities of His Primal Nature (Prakriti), and the three aspects of his Will and consciousness (Purusha), in their pure and primordial states, which wake up as He wakes up and regulate the creation. While we have no idea of what the Non-Being or the Nirakar Brahman truly is, we have the accounts of the Upanishadic seers who through self-contemplation realized Isvara and described Him as Sat chit Ananda, Truth, Consciousness and Bliss. This experience becomes possible in human beings because in the individual being, Isvara is verily Atman. In the Katha Upanishad says Lord Yama to the young Nachiketa ," By knowing through self-contemplation (adhyatma yoga) that Primal Being who is difficult to be seen, who is very mysterious, who is hidden in the cave (of ones heart) and who is situated deep (with in one self), the wise men (dhira) leave behind both joy and sorrow. It must be noted that there is no real distinction between Saguna Brahman and Nirguna Brahman. They are the different states of the Parameswara the One only Eternal Principle. When the Non-Being awakens He becomes Isvara and when Isvara takes rest at the end of creation He becomes Non-Being . He is the World Soul (Mahan Atma), the Cosmic Egg, that arises out of cosmic waters and engages Himself in the creation of forms and beings. He is the First Born (prathamaja), who manifests forms that are already contained in Him. Symbolically, he represents the rising Sun in the waters of the ocean. He is the Sutratman (the soul of a necklace) the thread on which all beings and all the worlds (the world of the devas, of the ancestors, of the humans, of the demons etc.) are strung like beads in a necklace. While Isvara is the causative principle (karanabhutam), Hiranyagarbha is the dynamic or the active principle (kriyabhutam or karyabhutam). He is also called Brahma who as the creative and dynamic principle uses the forms existing in Him and brings forth the Beings. The word "brah" means "bursting out or bringing forth" and "ahm" means ego. Brahma is therefore he who brings forth many "ahms" or egos or beings into this world using his divine power and matter and pouring life (breath) into them. Hiranyagarbha is not an eternal being, but comes into existence at the beginning of creation and becomes dissolved in Isvara at the end of creation. Viraj is the manifest world, that which is created, or which is brought forth. He is the result of the creative process set in motion by Isvara and accomplished by Hiranyagarbha. He is the manifested aspect of Isvara through the hands of the latter. It is a world that is in perpetual motion and subject to illusion. It is a reality that is different and distinct in nature from that of Isvara or Hiranyagarbha since the interplay of the gunas, the elements and the senses result in the formation of numerous individual beings and ego forms (ahamkaras) who suffer from the illusion of individuality and feelings of separateness. Viraj like Hiranyagarbha is also subject to dissolution at the end of creation.